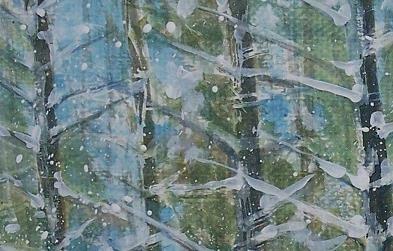 I wasn't exactly telling you the truth the other day when I wrote that I don't use white or black paint in a watercolor. What I should have said is that I don't use white or black when mixing colors. I will use black paint to sign a painting and I have used white paint to recapture white spaces that got away. And, white spaces can disappear quickly. Unprotected, they are subject to errant washes or mindless brush strokes. Such was the case with the recent painting I was working on. When I left you last with this subject, I was going to put the painting away and look at it a day later. When I pulled it out, I saw that I had to work on the branches of the trees some more. They needed better definition and shadows had to be put in place around the snow that had fallen on them. I wasn't pleased with the foreground...too much shadow was causing too much distraction from the trees (we say it's "too busy"). So, I went to work on the branches and trees and, when I had finished, I had pretty much killed all of the snow on the trees! Yikes. And, there was nothing to do to fix that, and get rid of the shadows in the bottom of the picture, except bring out the white paint. 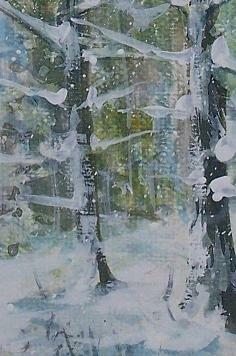 I pulled out a tube of white watercolor paint and started repainting snow. However, the paint was not completely opaque, so I was getting a dirty white...not the crisp, clean white that one would expect for glistening snow on trees. Not to worry, I've used something else in the past and reached for my jar of gesso. A white, acrylic based substance used generally for preparing painting surfaces, it stays bright white and covers other colors well. Now, of course, I don't have a pure watercolor, but I've moved into the genre of mixed media! ...I stood back and looked at it and, well, it was okay. I thought I had made it better, but not great. I did manage to clean up the foreground nicely and put some substance into the snow on the trees, but something was bothering me. Many years ago, when a painting was just "okay," I might put it away on my pile of "Almost paintings" or toss it all together. Again, I refer to my Monhegan Island days when Fred Wiley had once again critiqued a painting I was working on. As I was complaining about a watercolor at hand, Fred took out a small mat of about 5 by 7 inches and started moving it about the painting. His words to me were, "In every disaster there's a great postcard!" Voila, he found it and to this day I apply that activity to many paintings. It just dawned on me that Fred called that painting a "Disaster." Hmmmm...sounds like another blog topic! Anyway, this painting needed Fred's help. I took out my small mat and a pair of scissors and got to work. 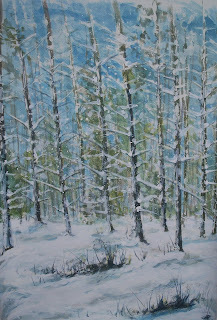 When I started this painting, I was working on an 18 by 24 inch piece of watercolor paper. It's a great size to work on, although expensive to frame and then hard to find a place to hang it without taking down several other pieces. But, when you decide that surgery is the only option you become excited with the fact that you are no longer looking at matting and framing a large piece, starting out to make one painting, and ending up with a dozen where one can handle the smaller mat and framing details easier! My wife will cringe, at times, as I look to start the cutting and tell me to "Leave it alone! It looks okay like it is!" I tell her it doesn't hurt the painting, at least not in terms of it feeling any pain. Then, when I point out to her that she might end up with several framed pieces that she can gift to family and friends, she'll cover her eyes as she moves away and tells me to let her know when it's over. More times than not the pieces are better than the whole, in quality. They can be easier on the eye as there's less to look at in any one of them. 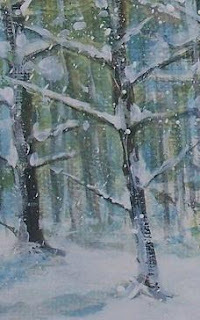 One painting can focus on trees, another on snow...a third might be of something that was completely unintended, but there it is after having a bunch of other stuff cut away from it. What was that famous saying about how to sculpt an elephant? Just cut away anything that doesn't look like elephant! In my case, I didn't have an elephant in mind, but I did end up with a bunch of studies that I thought were appealing. And, as I know that size does not denote quality, why should I try to sell one painting for $100.00 when I take that same one piece, do some trimming and try to sell the twelve from the one for $100.00 each! Math is a good thing! I especially like multiplication! Of course, now I have a dozen framed pictures that I have to try to find spaces for! You see, that's another dilemma facing artists...the creative process does not take into consideration the fact that we're not creating wall space!!! Oh well, I'll figure that out and then get on to my next masterpiece...I mean masterpieces! Paul, re: the postcard trick--I've found it's true with photographs too. In Picasa often I'll look at a photo and start cropping. When the cropping is done often there's an enlarged section left which is far superior to the original and contains details no one would have seen otherwise. Patty: Maybe if I applied the postcard trick to my dinner plate I could lose a few pounds...hmmmm. I think as artists we "see too much" and try to get it all in a picture...have to focus on what made us look there in the first place! Glad to hear others are taking scissors to their works and not out of despair!